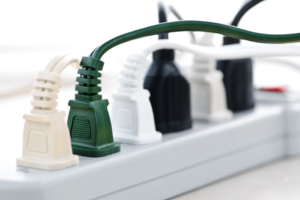 People often use power strips and extension cords in their homes. A power strip is unique in that it’s a single length of cable connected to a box with multiple sockets. It is also extremely convenient; you can set up multiple devices where there is only one socket available. However, connecting high-power appliances risks an overload and severe electrical damage; a power strip can be convenient, but must be used properly to avoid serious problems. Power strips are not designed for long-term use. Keep it plugged in for a few days, a week or two at most. If you need a long-term solution, install more sockets. The main reason for a strip is to temporarily use a couple of devices at once. Perhaps you need a radio or lamp in the same place as a computer, or other devices to work simultaneously. Do not plug in major appliances. Power tools, space heaters, and other high-current devices can be damaged, or you may trigger an electrical fire. If you must use a power strip, plug it into a single outlet. Plugging one strip into another is an absolute fire danger; never do it as you’re best finding other solutions rather than paying for the damage. Just as important is choosing the right strip. Make sure the unit is rated for the wattage going through it and there are enough plugs. Also, don’t use a power strip where it may be covered by fabric or cloth, which can catch fire due to heat exposure. A power surge can do a great deal of damage to a device or appliance, your wiring, or your home. Your best bet is to purchase a power strip that has a built-in surge protector. The label on the box should indicate whether the power strip has one. There should be a light or switch indicator on the unit as well. You can also buy a separate surge protector that protects your appliances and splits your outlet at the same time. Not all power strips are made the same. Aside from being designed for specific locations, they come in different voltage ratings. You should therefore know the voltage requirements of any devices you connect to the strip. If you exceed its maximum safe voltage rating, you can easily blow out an appliance or start an electrical fire. Power strips are not the answer to obtaining more power. If additional power is needed over the long term, consider installing more outlets. They are the safest power sources. Additionally, newer outlets come with safety features such as three-prongs and ground fault circuit interrupters. A GFCI will protect you against shocks, burns, and injuries if there’s a current imbalance and/or a power source is exposed to moisture. Makeshift adjustments, or any type of DIY electrical work, are never a good idea. A trained professional has the experience and tools to safely update your home. If you need any electrical work, contact Express Electrical Services, and our professional Los Angeles electrician will assess your situation. We offer same-day electrical services and are available 24/7. Feel free to call us anytime at 323-727-7799 or request service online. Nice post! I was looking for this kind of information and get to your post. Find it quite interesting and love your way of writing. Just follow these simple tips that shared on this post then you may properly use to power strip.